I had a chance to visit this place the other day. It was a totally random visit. I did not even know the place existed in the first place. Never heard of the place. Maybe because it is not as popular as other places. But believe me, it is majestically beautiful. So, where is this beach located? As shown in the map above, Pantai Penunjuk is located in Kijal, Terengganu. It is just 18km away from the nearest town, Chukai; Around 80km from Kuantan city center; And 150km from Kuala Terengganu. If you are from Kuala Lumpur, then you can get there fast by the LPT-LPT2 (Exit 845 Kijal). But if you prefer the scenic route, then you should take the Exit 836 to Cherating, and take the Gebeng Bypass to get pass the messy bauxite mining area. From there just continue north until you reach Chukai. Then keep on going north about 7km, until you reach an industrial area and find a signboard saying "Kaw. Perindustrian Teluk Kalung", where you need to turn right at the traffic light. Keep on going straight for another 10km, where you need to turn right into a small road which will go directly to the beach. Well, in these modern time, Mr. Google always help if you are lost. Provided there's network coverage that is. Which, the area is well covered. So, no worries if you are lost. Be sure to bring along powerbank! Notice how the fishermen boats up high on the beach. I was too excited taking the breathtaking scenery that I forgot to take the pictures of the surrounding. There is a food center and a lot of small stalls by the beach. Public toilet is also provided. The sand is white and beautiful, and the water is crystal clear. However, may I give a friendly reminder. The beach is quite steep, and the waves can be quite strong at times. Which is why a constant red flag is raised. Take note that it was in April, where during monsoon season (October to February), the weather gets rough and the beach is definitely off limit for safety reason. Anyway still, it is definitely a worth stop. There are these beautiful rocks formation, which has unusual shapes, at least as when I compare them with other rocks in other beaches. Those edges gets me. How did they form? Anybody? Is that... a dinosaur skeleton? These rock dump seems unusual to me. Seems a bit too unnatural. But who could move those massive boulders? Let’s get started with the image above. This image is straight out of camera (SOOC). What is wrong with it? Technically, nothing is wrong. The exposure might seem over, but the histogram says it is well exposed. Here is a bit detail on the shot. The lighting setup was a single speedlite off camera to the right frame with translucent umbrella, somewhere around 2 meters from her and at 45 degrees down. The other light source was a bright yellowish ambient light to her right. It was near noon so the sun was blinding bright. The whole area was in a shade but notice how bright that floor on the background is. I deliberately shoot the model without any makeup on her at all and chose her because she wears glasses (for the sake of personal challenge). So, before starting any editing, first we must make a quick analysis on what to do. What kind of mood are we going after? Facial spot. No one has the perfect face. Eyes contrast due to the glasses. Yellow color cast on the right side of the model. Blueish color on her left face due to contrasting light temperature on left and right. For mood, this is where you can get creative. It is up to your taste. For me, I am going for a clean standard portrait look. Nothing fancy. That’s it! We’ll go into elements removal on next post. Stay tuned! "Movie review? Wait, I thought this blog is all about photography?" Bro, don't forget the 'and what not' up there. Anyway, in this post I will be making a movie review on this magnificent piece of art titled Arrival (2016). I know, it's already 2017 but I just had the chance to watch it so shush. First of all, I am not someone that always go to the theater to check on new movies. I simply sit down in my room and browse around the internet to check on what movie is upcoming and take a quick glimpse on the synopsis. I only chose a very select few movie to watch, as I don't have much time to spare. 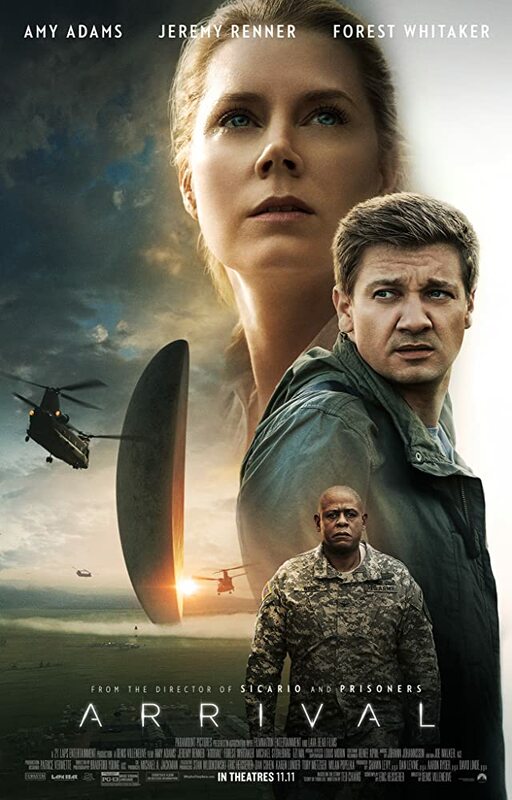 So, for this movie, the first thing that caught my attention was the alien theme. I'm a guy, and when I see science fiction movie I hit like. But not so fast. I don't want to watch another off-the-mill cliche alien action movie so I checked on the synopsis. What, an alien movie that has a linguist as it's protagonist? Immediately I know this is going to be good. But then I went on to watch the trailer. It's a bit of a mixed bag. A bit of tense plus action here and there, then we get to see some destruction to some city. I thought, whatever. Let's give it 2 hours of my precious lifespan. So what was good about the movie? As this blog is mainly about photography, let's discuss on the cinematography. Take a look at the amazing color tone that they applied for each scene. The usual blue/teal vs orange tone. Complimentary color really works wonder on images to make it pop. In this image you can see why the color tone works: It happens naturally during sunrise. And do we have anything more beautiful than a sunrise? Another blue/teal vs orange tone. Notice how the director chose an orange hazmat suit instead of the usual white or blue. The shadows, especially the wall has a deep teal tinge to it, complimenting the orange hazmat suit. I also love this particular composition. Perfect example of rule of third. When Dr. Banks had these visions about her daughter, the color tone changes drastically into a very deep orange/brown tone to further express the warmth and affection that she had towards her daughter. The color tone also works to tell the audience how the scene that they are seeing now is on a different timeline. The lighting of the scene also focuses much on the subject, putting out the background to barely lit. This kind of lighting further adds focus to the subjects and the interaction between them. Then there is a scene where Dr. Banks need to make a quick translation on a very important voice call of the China's General Shang. The sense of importance/emergency as well as tense was translated into a very deep blue/teal and green tone in the scene. 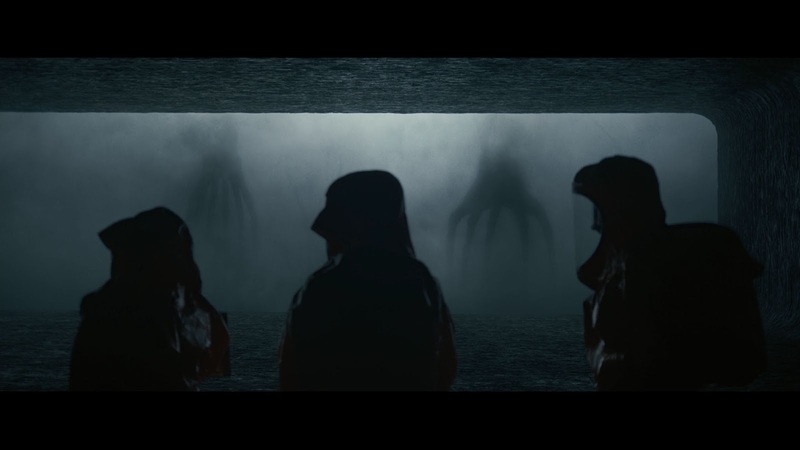 In the scene where Dr. Banks initially encountered the aliens, the color tone changed to a lot more grayish and dark as shown in the image above. De-saturated image conveys a lot of uncertainty and anxiety which works well in this scene. Also I love this little detail in the screenplay for the scene above which shows she clenches her fist on her first encounter with the alien which shows how terrified she was on that moment. This scene only lasts for about 0.5 seconds. Blink an eye and you'll miss it but it was there to really add the emotion into the scene. 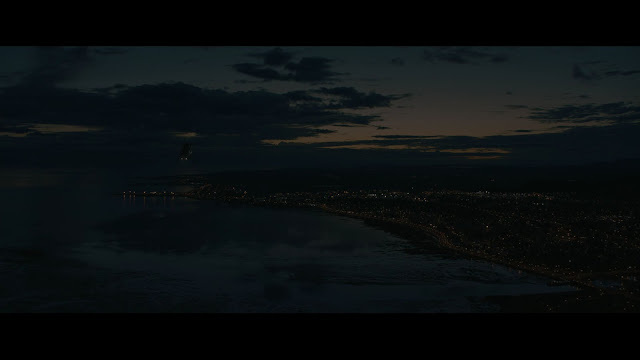 Another image from the same scene. Then there is this scene where Dr. Banks was lying beside here dying daughter. The great sad facial expression by Amy Adams was further complimented by the blue/teal and green color tone. Notice how the whole spectrum of shadows and highlights were filled with bluish tint. The visual art was very impressive that it compliments well with the emotions of the character as well as the message that the movie is trying to convey. About the story line, I really liked on how the writer got us to think on about the limitation that we have as a human in our communication capability. No matter how good our language is, we may never be able to convey nor comprehend each other 100%. "Language is the foundation of a civilization." Without language or a mean of communication, we may never be able to know nor understand each other. And not knowing is terrifying. Thus the aggression that we incite against something that we do not know and understand. But miscommunication may also lead to destruction. 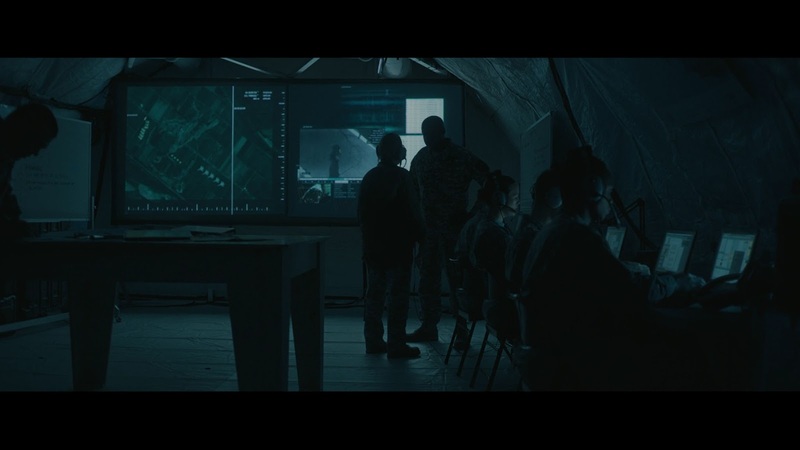 There is this scene where the marines were listening to some live stream show on the net. The guy was blaming the government for ruining the country's healthcare and military, and is not doing anything about the alien invasion. What was his source? Nothing credible but his own speculation. What did his action leads to? Aggression by the marines to ignore the superior and put explosives in the pod. These kind of toxic poison will always be present in our community as long as we do not understand each other. To understand is to truthfully communicate, not to assume. On side note, I could not grasp on the writer's idea on how understanding the alien's language may awake that time-leap memory ability. People are crazy about photo editing. Because they can simply make things that are not possible in the real world. Well, it's not like I hate editing. Improve overall exposure. Recover those highlights and shadows. Everyone does this. Remove distractions (over-bright stuffs in background, annoyingly bright-colored stuffs other than the main subject, etc.). Remove minor imperfections in the subject (glare and reflections mostly, skin smoothing, etc.). Color tone adjustment as extra spice. Anyway though, it is all subjective. In the other photographer's/editor's eyes, they need a different kind of 'cooking' to suit their need and taste. 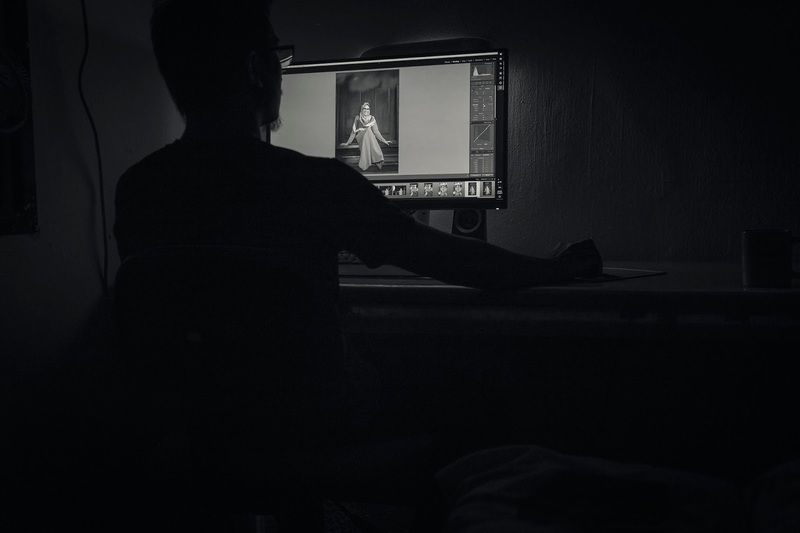 You'll need to have a super perfect clean and crispy clear image for stock photo or you'll risk yourself getting rejected by the ever strict judges. You can have an entirely out of world color balance for art projects. Art is subjective so yes, anything is acceptable. I hate this one but its the most popular human figure "refinement" abused by fashion photography. So, for a few posts up ahead, I'll share a few of my editing method that I have digested along the way. I had this opportunity to shoot the charming Syafiqah a few weeks before. She is my colleague in my new workplace. We don't really talk, although being in the same work space. At that time, I was out of images to publish, and then I found her smile to be quite captivating. So, light-bulb activated and bluntly I just asked: "Hi, can you help me to be my model?" It was just me alone so, I had to get her friend, Ufie to help being the light(wo)man. Syafiqah was shy and nervous in front of the camera as she had never done any modeling before. And of course who wouldn't be intimidated when someone is pointing some little bazooka at you with a big-arse white umbrella right next to your face? Well, but she was quite a natural at posing that quite a few times she just moved to a pose without me even instructing. Well, we had quite a fun during the photo shoot session that day. Really looking forward to have another session with her. A fresh start of a great new year. Wait, it's already end of January? To share any photography resources. Be it free stuffs, references, knowledge, and whatsoever. To share my work and how I achieve them. Sharing just the final image is boring *yawn*. There is fun in learning! To waste my remaining not so abundant time. And so, keep forward for my update on this blog! Which maybe... will be on a weekly basis. Engineer by day, freelance photographer by other. A random blog about photography. Take what you need and what you care, and please leave the rest as it is.